Whether you are a medical student applying in orthopaedics or a practicing orthopaedic surgeon nearing retirement, we are all students of musculoskeletal medicine. As such, we are also constantly learning about new developments and techniques within our specialty. There are countless resources for acquiring this new information–almost too many to follow regularly. 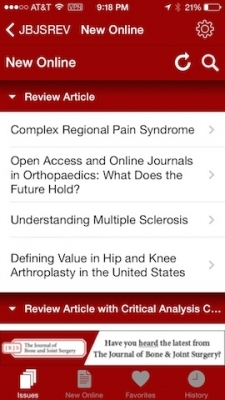 The Journal of Bone and Joint Surgery (JBJS) has introduced a new app that is an extension of their JBJS Reviews program. This new app seeks to synthesize the key topics that students of musculoskeletal medicine need to know. JBJS is a trusted and well established name in orthopaedic surgery. They provide high quality content and up-to-date information in the specialty of orthopaedic surgery. 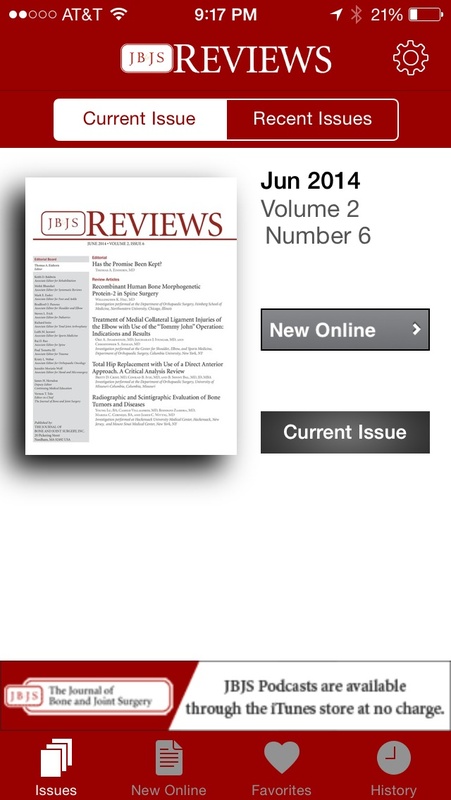 The JBJS Reviews publication has an associated subscription fee but many orthopaedic surgeons already subscribe to the journal and many residents-in-training or medical students can access the information through their academic institution. 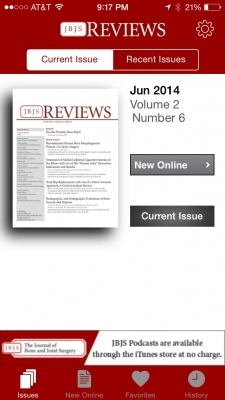 The app opens with an image of the latest issue of JBJS Reviews. The user can then select from the current issue or previous issues. The previous issues go back to January 2014 when the Reviews service was created. 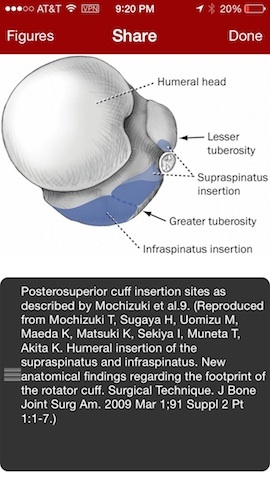 The publication comes out monthly and focuses on just a select handful of orthopaedic topics. The focus on a few topics prevents information overload. 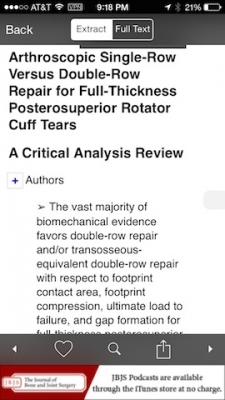 Review topics range from surgical techniques to common diseases. 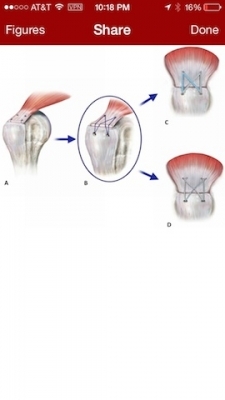 They also include topics on the general practice and state of orthopaedic surgery. Clicking on a journal issue takes you to a list of the review articles in that issue. Once you select an article, you have the option of reading a shortened extract of the article or switching at the top to the full article. In order to read a full article, you must have a subscription to the service or a remote connection through your institution if they provide this resource. Within the article, are several nice features. You can search the article for key words, email the article to yourself or share it with others, or favorite the article for review later using the bar at the bottom of the screen. The arrows on the lower bar allow you to switch between the previous and next article, respectively. The articles are enhanced with tables and nice anatomic images. Similarly, they have clear images that explain important concepts or techniques. The images can also be saved or shared through your mobile device. The app also tracks which articles you’ve viewed so that you can come back to them at a later time. This is a nice feature if you remember reading something recently but do not remember the title of the article. Free App to download, but the service requires a subscription that varies among users. Clear concise overview of key topics. Subscription price or need to connect to institutional network prior to full utilization of the app. The information is presented in a list format with easy navigation tools. Great use of color images and graphs. To receive the most benefit from the app, the user needs a subscription or institutional access. This app can be extremely useful to medical professionals working in orthopaedic surgery.